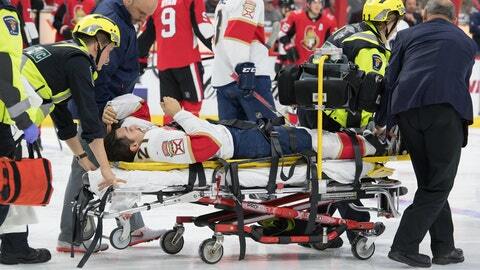 Florida Panthers center Vincent Trocheck (21) is taken off the ice on a stretcher after being injured during the first period against the Ottawa Senators. SUNRISE, Fla. – Florida Panthers President of Hockey Operations & General Manager Dale Tallon announced Wednesday that Panthers forward Vincent Trocheck underwent successful surgery to repair an ankle fracture and will be out of the lineup indefinitely. Trocheck, 25, sustained his injury during the first period of Florida’s Nov. 19 game against the Ottawa Senators. The 5-foot-11, 186-pound native of Pittsburgh, Pa., has registered 14 points (3-11-14) over 18 games this season with the Panthers. The 2017 NHL All-Star was originally selected by Florida in the third round (64th overall) of the 2011 NHL Draft.